There’s something about pre-packaged wraps that makes me sad. The cardboard cousin of plasticky sliced white, they’ve become synonymous with health in recent years, the ultimate ‘light lunch’ on the go, which in reality amounts to little more than minimal protein, soggy lettuce and over-seasoned sauce which weeps into each mean, thin layer. A homemade wrap – on the other hand – is a thing of joy: puffed and tender, soft with a slight chew and enriched with any flavour you might care to add. In fact, let’s call it flatbread for what it is and allow ourselves to accept its carb-based origins. Bread isn’t always bad. In fact it can be fresh and light and altogether easier on the stomach than the stodge contained within that shop-bought wrap. Lecture over. Let’s make flatbreads. 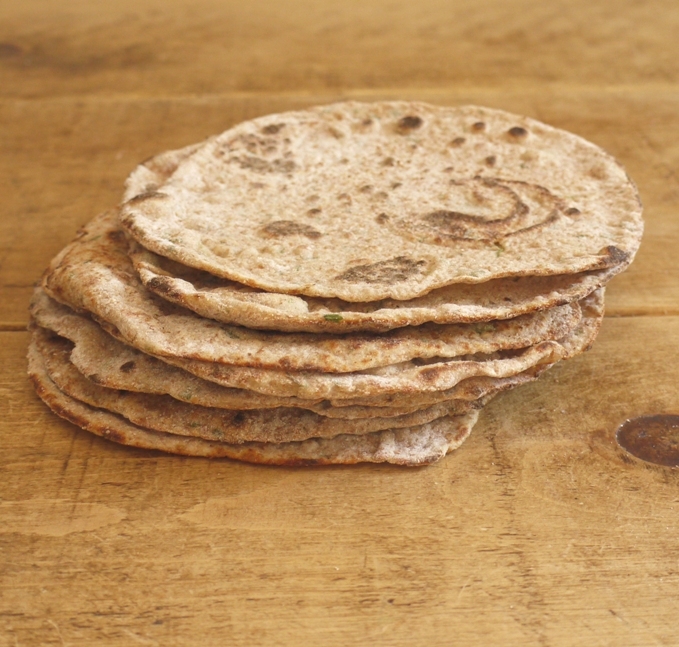 These flatbreads are made from a mixture of wholemeal and spelt flour, flavoured with fresh and ground coriander plus a pinch of cumin. They cook to puffed perfection in minutes and are best rolled to order, although if you want to make a batch in advance you can keep them fairly soft by wrapping in a cloth. The recipe is adapted from an Ottolenghi one I found online and these breads work beautifully with any Middle Eastern flavours. We used them to wrap tender shreds of barbecued chicken and za’atar roasted aubergine, slathering the lot in green tahini and a spicy romesco sauce but they’d also be wonderful for spooning up hummus or simply dipped in olive oil and sprinkled with dukkah. Next time you reach for a wrap on the supermarket shelf, put it down, stop and think about how easy they are to make for yourself. Actually don’t. Look the ingredients on the packet you’ve picked up then put it down and think about how easily you could make them yourself and how many nasty ingredients you could omit. The palm oil and preservatives, sugar and bleached white flour. Think of the lovely ingredients you can knead with your bare hands, the ground wholemeal grains, fresh herbs and aromatic spice. Pre-packaged wraps make me sad. Homemade ones make me happy. Which is exactly what cooking and baking is all about. Place all the ingredients except the vegetable oil/ghee in a medium bowl and mix to form a dry dough. Knead for a minute or so until smooth then cover in cling film and pop in the fridge for an hour. Divide the dough into 10 – 12 pieces, depending how big you want your wraps (or more if you want mini ones). Roll each piece into a ball then individually roll out into a circle around 2mm thick on a floured worksurface. Heat a small amount of vegetable oil or ghee in a saucepan big enough to hold the flatbread flat (or if you have a non stick pan, you can dry fry) and cook the flatbreads one by one over a medium heat for about one minute each side. Serve immediately with sauces and fillings of your choice. Fantastic recipe. Love making things from scratch rather than buying them. 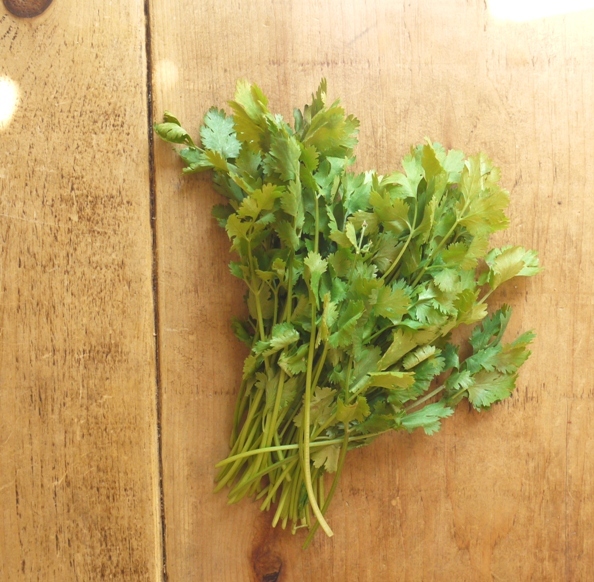 Love coriander. I agree, homemade wraps, and any homemade bread for that matter, is a thing of joy. It’s worlds away from the bought stuff. Thanks Jennifer. Do let me know how you get on – you might like the original Ottolenghi recipe too which involves a mushroom ragout to fill the wraps – perfect for a vegetarian dish! Yes, these should freeze well, wrapped tight between layers of greaseproof paper. Couldn’t agree more, bought wraps are like clammy bits of cardboard. I do make flatbreads, some times with more success than others but will certainly try this recipe, looks great. Amen!! And Thankyou for a wrap recipe that looks amazing. I so agree on the shop bought wraps, so sad and often so sweet as well! It’s awful how many shop bought products are rammed with unnecessary sugar – homemade all the way! Great recipe and I couldn’t agree more about homemade breads and wraps. I know it’s more time consuming but the end results are so worth it. Those look so good. I agree, they are easy and quick enough to make not to justify ever buying the industrial kind. Freshly made bread – of any sort – is a beautiful thing. I haven’t made flatbread before. I look forward to trying it! These look and sound great. I am so fed up with how maligned bread is. It is not an unhealthy food. Unless of course you are only eating sliced white bread a la Chorleywood method, containing a list of ingredients beyond the basic flour, yeast, salt and water, and eating several slices a day filled with yet more processed food. Flatbreads of this kind are a perfect example of a healthy bread and I love the flavours you have used here. I agree with you so much when you say: “Bread isn’t always bad. In fact it can be fresh and light and altogether easier on the stomach than the stodge contained within that shop-bought wrap” and applaud you for encouraging us to make our own flatbreads for our own wraps. Hurrah for Little Loaf! Hurrah for Yotam Ottolenghi too – love his recipes! I totally agree with you about store-bought wraps. They look so sad and unappealing…. On the other end of the spectrum, your flatbread looks divine! I love flatbreads. They are so flexible and they are one of the quickest and easiest breads even if you haven’t had much luck with “proper” bread. The cumin and coriander spicing sounds lovely. I’m trying to clear our cupboards of the shop bought stuff – you have to wonder what’s in it when it can stay that soft and pliable for days! It is hard to even say that flatbreads bought in the supermarket and the ones made by hand are the same thing. 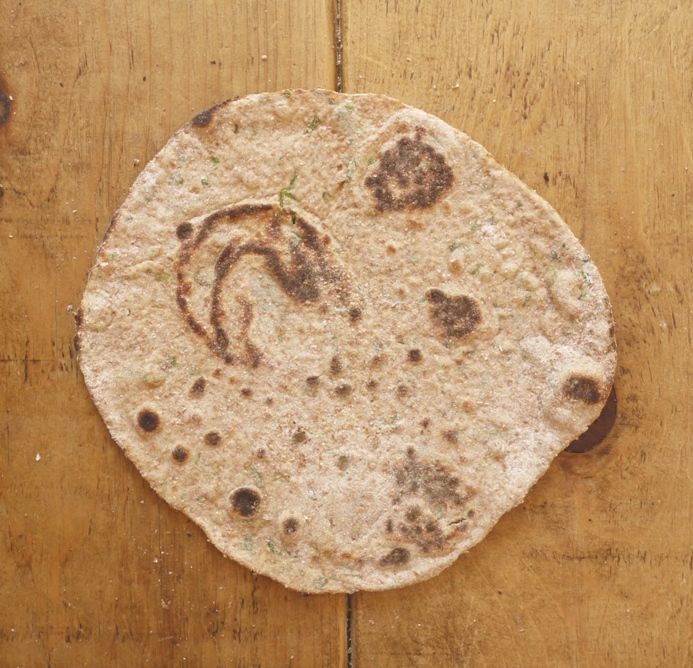 The texture of home – made flatbreads is so good. I like your idea of using wholemeal and spelt flour to giver them a more nutty flavour. Perfect for wrapping around both meats and vegetables in equal measure! Ah, this flatbread looks divine. Reminds me of leftse in the making of it, and makes me realize again how similar cuisines are around the world. Different base ingredients, similar techniques with similar-yet-different end results. You’re preaching to the choir here! And, oh, what delicious-looking flatbreads. YUM YUM YES. I love flatbreads of all sorts (as my previous post betrays) and this one sounds so good. Nutty spelt with fragrant coriander… I’m already imagining all the wraps I’d make with this! Amen! I so agree with you – nothing beats homemade bread. I am at home enjoying my mum’s sourdough bread at the moment and, like you say, homemade bread is so so delicious and does not have to bad for you. It feels good knowing there are no unnecessary and unwanted ingredients in my breakfast toast. And homemade flatbread? I made some for dinner for me and my boyfriend the other day and we ate it hot straight from the pan, so so good. I have not yet tried making a flavoured version of flatbread but your coriander version sounds like a great vehicle for hummus, baba ghanoush and other middle eastern or even Mexican delights! Jealous of your mum-made sourdough 🙂 I gave my Mum a recipe for sourdough and she sent me what she thought was a photo of her proud first loaf…except she had her new iPhone on videocamera function and sent me a hilarious shaky video of it instead! I go home is my mum’s bread – she got fed up with the bread you could buy a few years back and now bakes all of her own bread, baguette, ciabatta, sourdough, German rye breads, you name it. I usually end up eating bread 3 times a day and take as much as I can home with me! Oh I so agree about those sad and pathetic wraps you can buy for lunch. The thought just makes me shudder. These, on the other hand, look wonderful! Homemade flatbread is definitely better than store-bought ones! Will try out this recipe when I get the chance–thanks for sharing! I discovered coriander seeds a while ago, and use them a lot now. Love how you added them here! And yes, making flatbreads at home is easy and a fun thing, plus the final thing is amazing. I like the idea of the aubergine filling. Just bought wraps today. Tried one and scolded myself for not making them. In the time it took me to walk to the shops, buy one, then head home then heat it it, I could have made them at home AND lazed in the sun smugly. 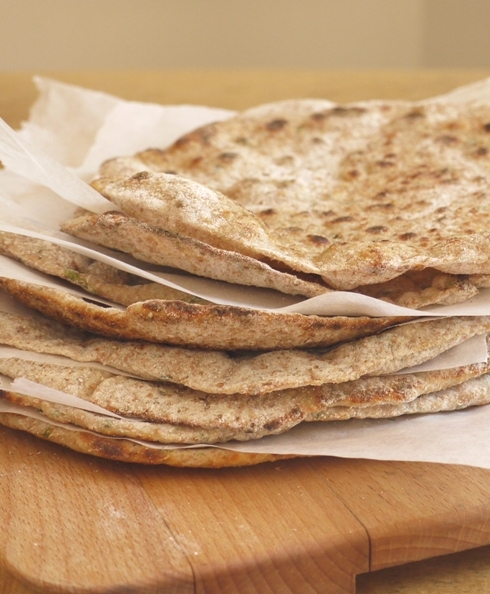 I love making flatbreads but am yet to find a recipe I’m happy with – will def be trying these! Shop bought wraps belong in the bin alongside cheese slices! I’ve been toying with the idea of making real tortillas and buying a press. Have you tried this before? Great looking flatbreads! I haven’t got a press but have thought about buying one – apparently it makes corn tortillas much easier! Hi Abbie, Hope you both enjoy the recipe! You can use wholemeal or white spelt flour for these, whichever you have on hand. If you use wholemeal, you may need to add a tiny bit more water but I’d use your judgement and feel how sticky the dough is. Hope that helps? 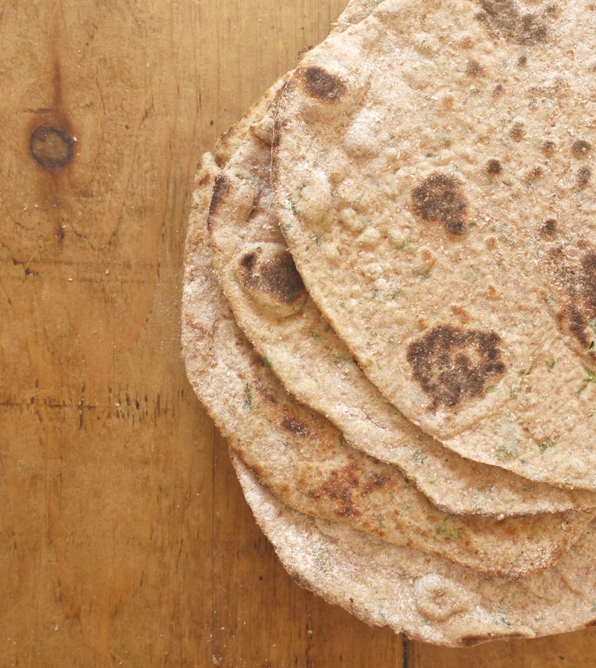 This is very similar to a yeasted flatbread I make, but never thought to add spices – genius! Thanks for the idea!